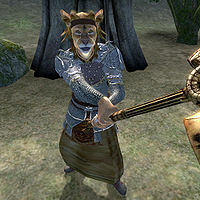 Ayisha is a Khajiit bandit camped out near Fisherman's Rock north of Leyawiin with her gang members, Mogens Wind-Shifter, J'Baasha, and Mensa Selas. When Mogens commands it, Ayisha will attack the player and Mazoga, inevitably resulting in her death. Ayisha does not appear at the camp until the player agrees to take Mazoga to Fisherman's Rock at stage 50 of the quest. When she becomes active, she will spend her time sitting on one of the battered stools near the fire or just simply wandering around the camp. All of Ayisha's equipment is leveled, which consists of a blunt weapon and a set of light armor including boots, gauntlets, greaves, a cuirass, and a shield. She also carries a lower class pair of pants. If you try to talk to her she will say "Ayisha minds Ayisha's business. Maybe you should try this, too", ending the conversation. Mazoga the Orc: Count Marius Caro is concerned about Mazoga, an Orc at Castle Leyawiin who claims to be a knight.